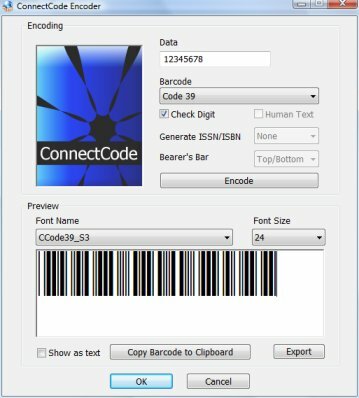 ConnectCode Free Barcode Fonts is a generous barcode package that offers three robust barcodes commonly used - Code 39 , Industrial 2of5 and Postnet. This package enables the creation of compliant barcodes for mailing labels, products tagging, inventory control and supply chain management. The versatility of using fonts allows barcode generation to be integrated into any software that supports text input and font selection. Moreover, when a font is printed, it rasters to the resolution of the printer and will not be limited to the DPI (Dots per Inch) of the computer screen. This behavior provides users with barcodes of the highest resolution in a given environment. a command line (or console) application for generating barcodes in scripts or third party applications. Alternatively see our Free Mac Barcode Fonts Software or Free Excel Templates that uses this barcode fonts for Asset Tracking. Code 39 is one of the earliest and most popular barcode. It supports numbers, uppercase characters and several punctuation characters. Industrial 2of5 is a widely used barcode for encoding numbers. It is called 2of5 because the barcode is always encoded with 2 wide bars and 3 narrow bars (total of 5 bars). Each of the bars is separated by a narrow space. Postnet is a fixed width/height barcode that is used widely by the U.S. Postal Service. It encodes numeric digits by using 5 bars and 4 spaces. The bars have two different bar heights, short and tall. How to create a Code 39 barcode in Excel? How to create a barcode in Word? Install DLLs, Excel formulas, Access sample into the Resource subfolder. On your system, go to "C:\Program Files (x86)\ConnectCodeFree" or the location where the software is installed.